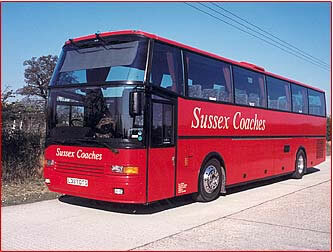 At Sussex Coaches we pride ourselves not only on the presentation, and comfort, of our fleet, but also the level of safety we provide, that's why every one of our vehicles undergoes a rigorous ministry approved maintenance programme, which includes stringent daily safety checks, and an intensive four weekly inspections and service. All coaches are fitted with speed limiters, seat belts, and secondary braking devices for both your comfort and safety. We take safety seriously, and our excellent record with the Department of Transport and Vehicle Inspectorate reflects that. Why give up the comfort of your car? Because you can unwind and leave it all up to us, enjoy the countryside as you pass it by; through our wide, lightly tinted windows, relax into comfy reclining seats, control your environment with individual controls, help yourself to a coffee or simply have a doze or read a book. You can even make business presentations en-route to your destination; with our modern engines, sound proofing, and air suspension you'll hardly know your travelling. You can expect your coach to turn up on time, beautifully cleaned, serviced and ready to go. Have a look below at some of our vehicles and facilities we offer on board. What Facilities Can You Expect on Each Size of Coach?